Cauliflower tastes awesome when it’s roasted! Inspired by our Roasted Cauliflower recipe we take this cruciferous vegetable, roast it and then add something simple, like spaghetti. 1. Roast the Cauliflower by following our recipe. 2. Cook the spaghetti al dente! 3. 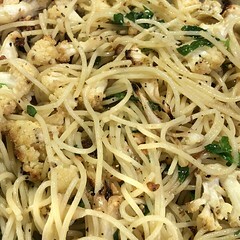 Toss the Roasted Cauliflower and spaghetti together.